Our Wednesday Evening Lenten Program continues on February 24 at 7 PM, with the evening devoted to prayer, meditation and discussion of Chapter 8 of Dr. Hugh Brady’s book, A Spirituality of Being Human. It is not necessary to have read the book to participate, but we hope you will take advantage of this opportunity for spiritual growth. Dessert and coffee will be served. We are grateful to everyone who contributed to the February 17 soup supper, but we are still looking for cookie bakers and – most importantly – a few folks to help with clean-up this week and on March 2 and March 9. If you can help, please add your name to the sign-up boards on the table near the rectory-side door. Click HERE for additional information about the 4-week program and CCCB Lenten Journey Masses. This week’s Lenten Journey Mass will take place at 6:30 PM on Monday, February 22 at Ss. Columba-Brigid Church located at Eagle and Hickory Streets. Change in Parish Council Meeting ~ The Parish Council will meet this Wednesday, February 24, from 5:30-6:30 PM. The time of the meeting has been changed and sandwiches will be served so that Council members can participate in the Lenten Program at 7 PM. Our Lenten Journey Mass ~ Blessed Trinity will host the Catholic Churches of Central Buffalo for the Lenten Journey Mass on Monday evening, February 29, at 6:30 PM. It is also our turn to provide finger foods and desserts for the social following the Mass. If you can help in this regard, please sign up THIS WEEKEND. 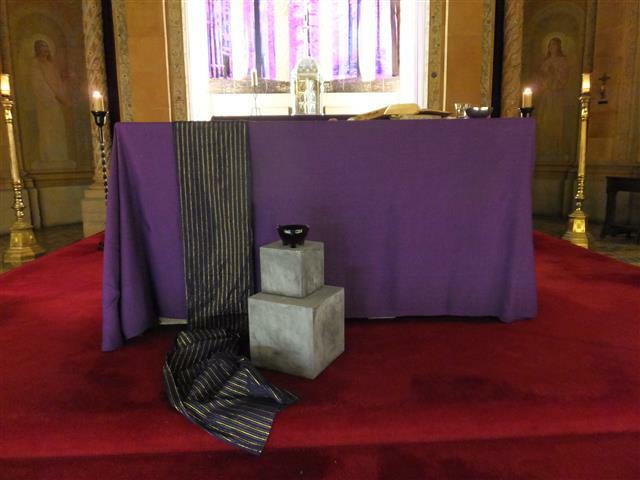 The sheet for the Journey Mass Reception will be found on the altar rail near the baptismal font. The Ladies Sodality will present its second “Celebrating Women Witnesses” program on Sunday, March 6, following the 10 AM Mass. Dr. Althea Porter will facilitate the discussion, this time focusing on women in the early Church. All women of the parish are invited to attend, and friends are invited. Please save the date. Lenten Handouts ~ There are extra copies of three special publications that the parish has provided in the hope of enriching your Lenten experience. We encourage you to take copies from the usher’s bench for family members and friends. 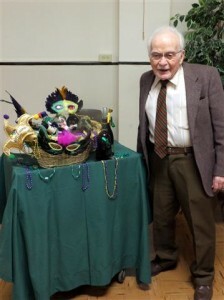 Ed Marien posed happily with his Basket of Cheer. The Ladies Sodality extends sincere thanks to everyone who supported the February 7th raffle, which raised more than $900. Ed Marien won the Basket of Cheer, and Jim Duffy and Florentina Dozer were able to do their last-minute Super Bowl shopping with $50 gift cards from Wegmans and Dash’s. We are especially grateful to Bill Warren and Hertel Parker Liquor for donating the “cheer” for Ed’s basket. Catholic Charities Appeal ~ Ash Wednesday marks the beginning of Lent and commemorates the start of a period of preparation for Jesus’ Resurrection on Easter Sunday. As you start your own Lenten Journey this week, remember the selfless sacrifice of Jesus. What can you sacrifice that will allow you to donate just $3.12? That’s the cost of feeding a family of four one meal through one of Catholic Charities’ eight food pantries. Remember the love you have for your neighbors in need, and give as generously as you can to the Catholic Charities 2016 Appeal, benefitting tens of thousands in Western New York. Find Good Within. Open hearts to follow Jesus’ lead. Find out more at www.ccwny.org or call 716-218-1400. 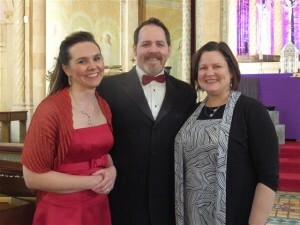 Soprano Amy Grable, tenor Robert Zimmerman, and pianist Dr. Lori Abbott following their Valentine’s Day performance. Click HERE for additional photos from the concert. Blessed Sacrament Church’s Fish Fry Dinner will be held on Friday, March 4, from 4:00 – 7:00 p.m. in the Catholic Academy of West Buffalo Gymnasium, 1069 Delaware Avenue, Buffalo. Adult Dinners $12; Child (10 & Under) Dinners $6. Takeout will be available. All Dinners include: potato salad, coleslaw, rye bread, beverage, and dessert. Tickets can be purchased after all Masses, visiting the rectory during normal business hours, calling (716) 884-0053, or emailing bettyh [at] blsacbflo [dot] org. Pre-order of tickets requested. A limited number of tickets will be available at the door. Respite Weekend for Women with Cancer ~ March 4–6, 2016 at Stella Niagara. Application deadline is Thursday, February 18. If you know someone, applications are available by calling Sr. Maureen at 897-9948, x114. Walking the Way of the Cross: Biblical Reflections on the Land ~ Presenter: Sister Laurie Brink, OP on Saturday, March 12 from 8:30 a.m.– 3:00 p.m. at the Millennium Hotel, 2040 Walden Ave, Cheektowaga, NY 14225. The Catholic Biblical Studies Program proudly announces the 24th Annual Lenten Day of Reflection. This will be a virtual Holy Land Retreat, drawing on familiar images and places mentioned in the Gospels. As you enter into the final days of Jesus’ life, you will imagine the journey of Jesus and the disciples as they ‘set their faces toward Jerusalem,’ journeying from Capernaum through Jericho to the Holy City and finally to the cross… and beyond to the empty tomb. Sister Laurie is a Dominican Sister, associate professor at the Catholic Theological Union, Chicago, and associate editor of The Bible Today. Her study and research has taken her into the ancient social, religious and cultural world out of which Christianity emerged. Please contact the Catholic Biblical Studies Program (716) 871-9180, info [at] cbstudies [dot] org, or www.cbstudies.org, for registration information.